founded in 2003, but quickly became a top selling brand that rivals Duncan and Yomega in terms of design, quality and performance. 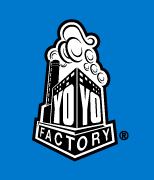 YoyoFactory makes an extensive line of yoyos that cover almost every type of yoyoing, focusing on competitive play. And with patented innovations like hubstacks and fully active starburst technology, they continue to advance the technology of yoyoing in general. The bulk of the YoyoFactory line of yoyos goes into the "advanced" category, which means that the yoyos are “unresponsive” and you need to know how to bind in order to use them. So if you are an absolute beginner or only have very basic skills, stick to the beginner to intermediate yoyos and wait until you get better before you buy their advanced "unresponsive" yoyos. This guide will help you choose which models are best for you. This buyer's guide is for YoyoFactory yoyos only. If you want to see our guide for all brands, check this page. If you're a beginner, then the first YoyoFactory yoyo you should consider is the first one that they ever made, which is still just as awesome today as it was when they released it. It's called the FAST 201 yoyo. FAST stands for Fully Active Starburst Technology, which is basically the response system that makes the yoyo easy to use for all of your basic to intermediate yoyo tricks. It’s a plastic, ball bearing yoyo that is durable and sleeps well to make it easier to complete tricks. The Spin Star yoyo is another YoyoFactory model with the FAST response system that makes it a great choice for beginners who are learning all of the basic and intermediate yoyo tricks. It’s durable, it fits well in your hand, and it just plain works. The ball bearing axle gives it extra long sleep times. The YoyoFactory One yoyo lends itself a little bit more to the intermediate skill level than the absolute beginner. Durable plastic design and comes with two different yoyo bearings. One bearing lets it wake up like a regular yoyo, and the other bearing makes it an "unresponsive" yoyo that requires a bind, for advanced play. It’s "One" yoyo that you can use for all types of tricks. POPULAR CHOICE! The YoyoFactory Velocity yoyo is another yoyo in the one size fits all category that is basically an update to the FAST 201 design. Using an "Adjust-o-matic" dial on the side, you can make the yoyo very responsive and easy to wake up for beginner to intermediate play, or change it into an "unresponsive" yoyo for advanced play as your skills increase. The Grind Machine yoyo was the first plastic advanced yoyo that YoyoFactory released with its Hubstack technology -- basically, two ball bearing pegs on each side of the yoyo that allow a different style of play. It is still one of the most popular advanced plastic yoyo models, and it is a lot of fun for advanced yoyo play. The Protostar yoyo was designed with one major goal in mind. To build a plastic yoyo that performs as well as a metal yoyo for advanced play and yoyo tricks. And they pulled it off! 2008 World Champion John Ando helped them perfect it. The Protostar gives you long spin times and high performance like a metal yoyo, but at the cost of a plastic one. It's a great deal and a must have for your collection. Once again, I should mention the Velocity yoyo. Although I have it listed in the beginner to intermediate section because it is adjustable, the Velocity also has a setting to play as a completely unresponsive yoyo. That makes it is very popular for advanced players too. I've probably said this a million times, and I’ll probably say it a million more. When you use an advanced yoyo that is "unresponsive" / "non-responsive," it will not wake up when you tug on the string. You have to learn how to do a “bind” trick to make it wake up. Unresponsive yoyoing is for advanced players, and takes some patience to learn. It allows tricks that are not possible with a traditional style of yoyo. These metal yoyos are all non-responsive yoyos, so keep that in mind. POPULAR CHOICE! The DV888 yoyo has been one of the most popular YoyoFactory metal yoyos since its introduction, and remains ultra popular even today. Why is it so popular? Because it rocks. It’s a slightly smaller size that fits well in your hand, and it is priced right. Terrific performance, at an amazingly low price for a metal yoyo. We also carry it in a boxed gift version. The Pop Star yoyo is a smaller sized metal yoyo. Not tiny like the Mighty Flea, but definitely small enough that you notice it isn’t “regular” sized. The smaller size makes it less expensive, and also a lot of fun to play with because it feels so different in your hand. The Shutter yoyo was newly introduced in 2013 and has been an instant classic. It is the signature yoyo of YoyoFactory pro Gentry Stein. It’s all about weight distribution that gives you power, speed and control through extended length string tricks, and good grinding ability. Best of all, it is on the lower end of the metal price scale, much like the also popular DV888. The YoyoFactory Super G yoyo is another signature yoyo by Gentry Stein that we see regularly when we are packing orders. It has a lot of weight around the rims, for super long spins and extra stability so that you can nail the hardest tricks. The YoyoFactory Genesis with Hubstacks yoyo is a super advanced metal yoyo designed to perform. Hubstacks are bearings on each side of the yoyo that you can grab and hold while the yoyo still spins. It’s a little more expensive than some of the YoyoFactory models, but it’s worth the price. And speaking of expensive, we couldn’t write this guide without telling you about the most expensive YoyoFactory model of all, the Ricochet yoyo. Made of solid titanium and manufactured in a limited, numbered series, it is a highly sought after yoyo because of both the collectibility and the performance. Buy one now before you lose the chance and it’s gone. The Stainless Steel Whistling Yoyo is almost certain to be a collectible classic 10 or 20 years from now. But who could stand to keep it in the original box when it’s so much fun to play with? This yoyo instantly grabs your audience’s attention, and is just plain cool. The Mighty Flea Yoyo is probably the weirdest and hardest to use advanced yoyo on the market. Which is what makes it so awesome. If you can pull off a trick with this yoyo, you’re the real deal. When you pull this out of your pocket and make it clear that you are about to do a yoyo trick, people will laugh. But they won’t be laughing anymore when you actually complete difficult tricks with it. Whether you are buying a YoyoFactory yoyo or any other brand, you’ll want to make sure that you buy extra yoyo strings, and probably a trick book or trick DVD so that you can keep learning new tricks and advancing your skills. See our full line of strings, trick books, DVDs and other accessories. Strings wear out quickly, so make sure you have at least a few extras!